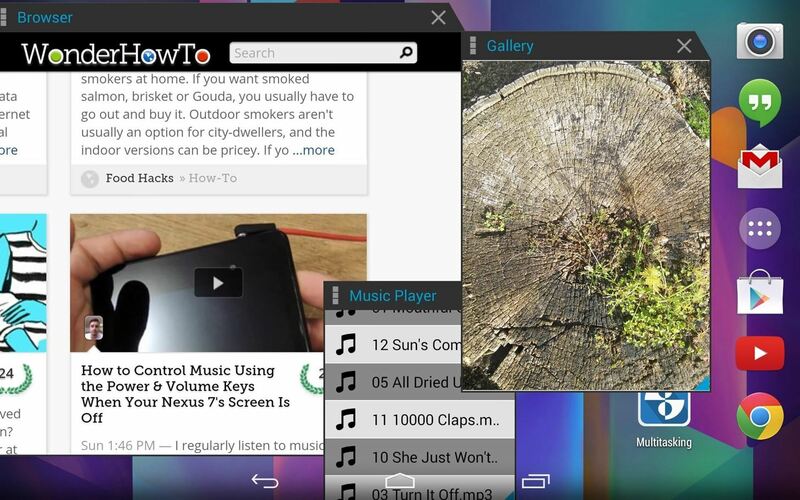 Recently, I offered a guide detailing how to run two separate windows on a Nexus 7 tablets for better multitasking. While extremely useful, that mod was limited to only two windows, and you also needed root access to use it. Today, I'll be highlighting a non-root Android app that doesn't limit you to just two separate windows. It's called Multitasking by Oryoncorp, and it lives up to its name. Open the application and go through the extremely simple options—it's pretty basic in terms of what you can do. Start by turning the app on in the top right corner, then select whether you want it to start automatically at boot. Work Area Limitations will limit windows to the perimeters of your device's screen, and I recommend leaving this setting unchecked so you can move windows partially off screen. You may also want to adjust the Activation area to a comfortable size—for me, setting it to the largest area allowed for easy access. 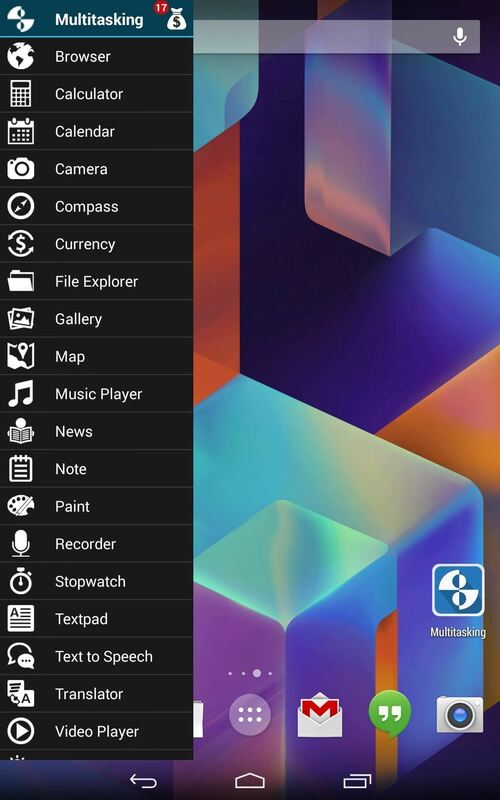 Other options include the ability to toggle the animations for opening the drawer and launching apps, setting default window sizes, and enabling pinch-to-zoom (versus one finger scaling). Simply slide from left to right on your screen to open the sidebar where you can access specific apps and tools. Unfortunately, we're limited to the app's stock apps right now, but they are actually pretty good. No, you can't use Chrome or your standard Gallery, but the alternatives are easy to use and everything but the camera works flawlessly. Hopefully an update can enable the use of third-party apps, but for a non-root app, it's safe to say that I'm impressed. Turn your Nexus 7 sideways and utilize it in landscape mode, which seems more convenient when getting work done. On the negative side, this app is "free" but the amount of windows you use depends on credits, which can be earned either by liking, rating, sharing, watching ads, or other ways it provides. You can always just let the ads run while you're not using your Nexus, but yeah, it's a bummer. Developers need money too, and virtual currency is a way to generate revenue based on us, the people happily using their apps. He has stated that virtual currency will not be required in the coming update, but its replacement is anyone's guess. Give the app a try and let us know what you think. 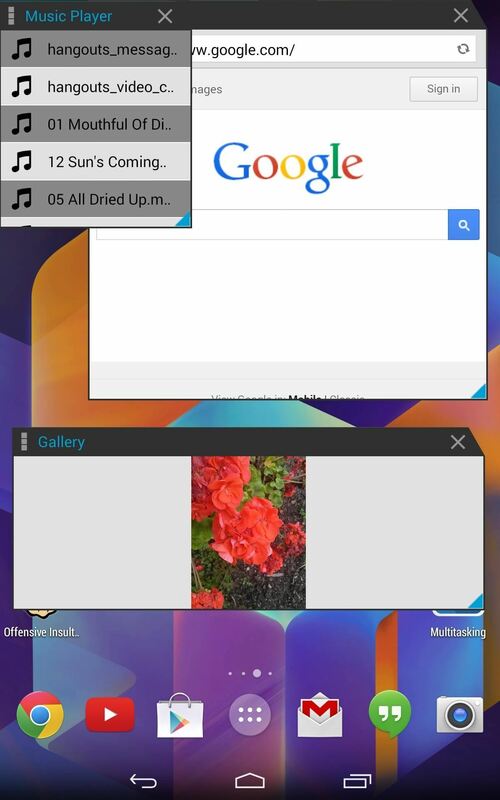 Finally, true multiple window multitasking on our Nexus 7s, all without requiring root—very cool indeed.